Have I mentioned how much I love pinterest? Seriously, I do. I've been finding some awesome things on there. If you're on pinterest, then you can follow me if you'd like. This is one of the awesome things I've found. Oh my, this was amazing. 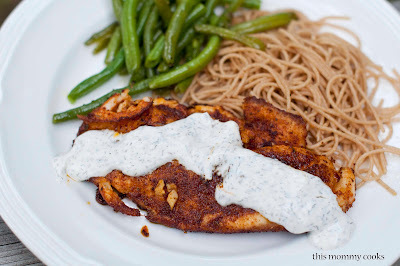 Usually broiled tilapia parmesan is my favorite way to make tilapia, even though I haven't made it in awhile, but this has now become my favorite way to prepare tilapia. I can't stop thinking about it. And the sauce, oh the sauce, it is what made this so unbelievably good. My hubby put it on everything on his plate he loved it so much! Please try this. I know you won't be disappointed. *note: I halved this recipe, so it works doubled as well. Combine all ingredients in a bowl and mix well. Cover and refrigerate for at least one hour. Mix all seasonings together in a small bowl. Place fish in a shallow baking dish sprayed with nonstick spray. Sprinkle seasonings on top of fish covering completely, flip the fillets over and season the other side. Place in fridge for 30 minutes. When ready to cook, heat olive oil in skillet for a couple of minutes. Add in fish and cook on each side for 4 minutes, or until fish is cooked through and flakes easily. Remove from pan, letting the excess oil drip off. You could drain it on paper towels to be a tad bit healthier. When ready to serve, place on a plate and top with dill sauce. Go ahead and put the bowl of dill sauce on the table, because you'll want more than you think. That stuff is so good!